I recently checked through a Torah that had been rescued from Germany just before Kristallnacht in a suitcase. It is going to require some considerable restoration and means a great deal to the family and congregation that it is loaned to. However, four or five amudim have very bad moisture creases. I have been in touch with the British Library regarding parchment restoration and also chatted with a sofer colleague but was wondering whether anyone on the forum has practical experience of dealing with this. I don't want to replace the yeriot if I can help it because of the historical nature of the Torah - it has lots of marvellous kabbalistic taggin and special otoyot. 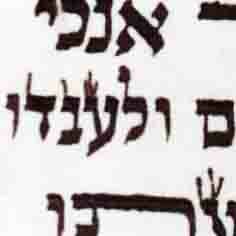 Also, I would be interested in the view on kashrut if the crease is particularly heavy and obscuring the letters even if they are a) there and b) complete when the creases is pulled back, as I've only dealt in the past with relatively minor creasing where the letter was still guf echad or where addition of ink made it so. The paper towels are needed to soak the water out of the klaf. The cloth is needed to prevent the paper towels from sticking to the klaf and leaving lint on it. After this repair, you cannot tell that there was ever a crease. 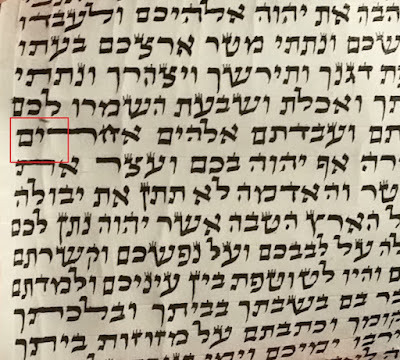 The ink in this sefer is probably not water resistant. The only thing I can think of is scraping off the writing on and near the crease (hopefully there are no shaimot in the way), then wet the crease with a brush and do the repair as shown above, then rewrite. I see in the picture that there is a Shem right on the crease. Are you sure that the crease was caused by moisture? 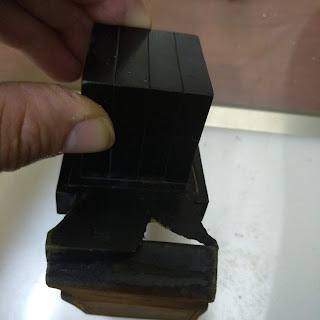 If it was, and the ink did not spread, then, wet the crease on the rear of the klaf with very little water, then press it flat as in the comment above. You may have to do it a few times, until the crease disappears. You want to do it with very little water to make sure the ink does not spread. It will take three people to do it. Two will stretch the Yeriah to open up the crease, and one will build the sandwich and clamp it tight with C clamps. Try it on a small section first, to make sure there are no surprises. And, most important of all, please tell us the results. Zvi - this is all excellent advice. It will be a little while before the Torah is delivered to me to start on the repairs(the pictures are from a check I did a month ago)as I'm working on another at present but I'll certainly tell the forum the results. I'm not sure what caused the creases but usually it has been moisture. there are at least 4 amudim with creases in so will start with the least resistant and then work my way up if the method you are outlining works - and yes there are Shemot. Right now the ink is very dry, so the first cycle may work fine and not spread the ink. If you have to do it again, the ink already absorbed some water and might spread when you wet it again. So, use a warm hair dryer to dry the ink very very well before doing the repair cycle again. Another method you may wish to try that I've used with success on very old Sifrei Torah is this. Prepare a large sheet of plywood say at least 10-15 centimetres larger on all sides than the yeriah of klaf. All along the outer edges of the board insert eyelet screws every four or five inches. To these, attach sturdy cords long enough to reach the klaf and bulldog clips such as are found in office supply stores. Next, detach the klaf from the sewing on both sides and gently humidify it. I'd recommend using a cold-air room humidifier moving the klaf over the stream of air until it feels noticeably slack and relaxed. Don't get it wet as the ink will likely run. Now take it to the board and stretch it using the bulldog clips. Tighten the cords around the eyelet hooks until the klaf is evenly taught all the way around. Let it dry thoroughly away from heat or direct sun. The crease should vanish completely. I learned this method from a professional conservator who works with medieval parchment documents. It's intended to mimic the way the klaf was made in the first place when it is soaked in water and stretched on a frame. Please be aware that sudden shifts in temperature and humidity will cause the klaf to cockle, shrink, warp and distort. The effect of such rapid movement on old brittle ink can be disastrous and will almost certainly cause the ink to flake off. Another issue to check for is that often at the bases of very old creases the parchment is worn quite thin and sometimes already torn. In which case stretching is not such a good idea.